Today, the Democrat and Chronicle printed a letter from George Cassidy Payne , one of Talker‘s most active contributors. 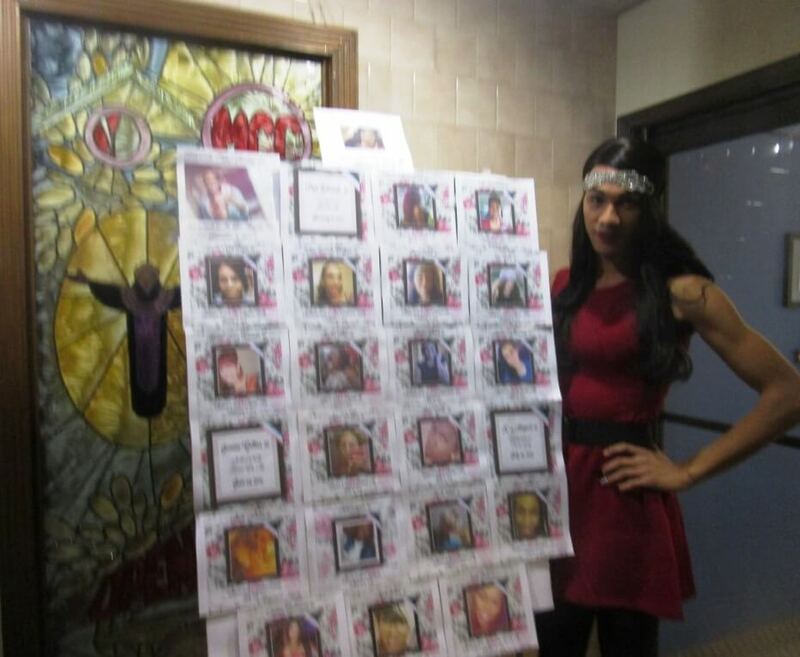 George’s insights led me to revisit an article we did, Transgender Day of Remembrance. Did it all begin with Jean de Arc? Open Arms Pastor Brae Adams joins the conversation (BELOW). on the Open Arms Metropolitan Community Church of Western New York on East Main Street. In the entrance to Open Arms, on part of a wall hang dozens of name tags. Worn by all members and visitors if they choose, each tag simply includes a name and 3 pronouns for each: him, he, his or she, her, hers or they, them and theirs. The tags are the great equalizer at Open Arms where each person can identify what pronouns represent themselves and their truth. So no one is singled out for their outward appearance, the tags are worn by all members regardless of their gender identity. Everyone is known and respected as they understand themselves. The name tags at Open Arms and the environment they foster are tangible evidence that George claims are more than valid. To show solidarity for an event and a cause deserving support and its own kind of celebration, I visited Open Arms Metropolitan Community Church of Western New York on East Main Street. All day Friday, Open Arms was holding a vigil to honor the many transgender lives lost to violence in the past year. 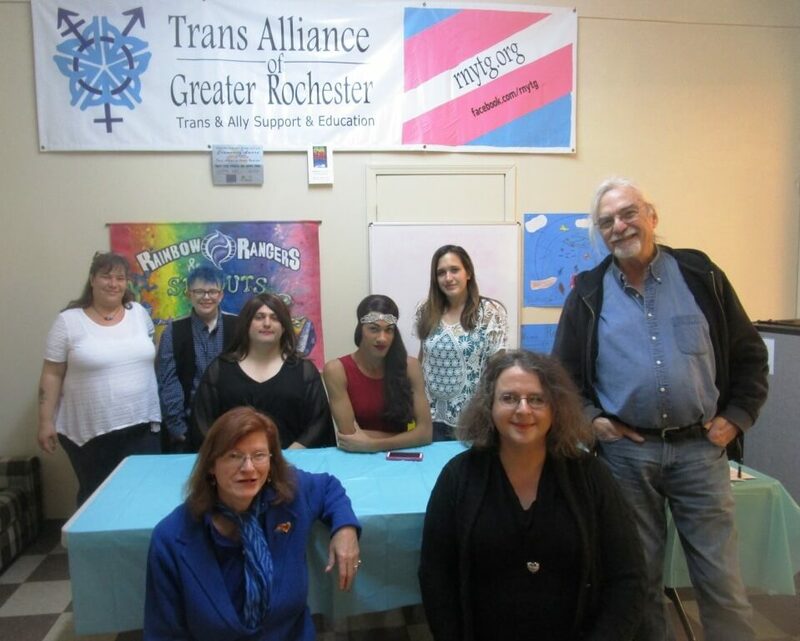 Open Arms MCC, established in Rochester in 1981, welcomes all individuals regardless of their sexual orientation or gender identity. Not as well versed as I would like in the transgender movement — if it should be called that — I did some preliminary research. My attention caught by one small part of the discussion. Was Joan of Arc transgender (for which there were 8 responses on Yahoo questions)? Hook in hand, I inquired of Open Arms’ Lay Pastoral Leader Brae Adams: was Joan transgender and what does asking — and answering — that question say about transgender folks, past and present? Funny you should ask, said Brae. Actually, a portion of the thesis she is writing for her master’s work at Colgate Divinity School is devoted to that very topic. Serendipity. Had my angle! Was Joan of Arc the first transgender saint? Hard to know. She wore the armor of a man and fought in seven successful battles, even directing troops for France in the Hundred Years war against England. What is certain is Joan wore the armor of a man in combat. Possibly out of practicality. After all, most likely women’s clothiers were not well versed in chain mail. The battle field was no place for a woman’s corset and petticoats. Even when captured and tried by the English, Joan dressed as a man. Only when she,“stood confessed and convicted did she permit herself to be dressed as a woman.” (Holly Dever, FTM Female to Male Transsexuals in Society, 1997, Indiana UP) Does this mean she was transgender? Surely there is validity to that claim. Historically, hard to know. What is certain is that she was surely no slave to the gender conventions of her day. Had just the beginning of my answer. Hardly limited to 150 words (Pastor Brae was only 4 words over the mark!) our conversation ranged from the Spanish Inquisition, Huxley’s Brave New World, Caitlin Jenner, Queen Victoria, biological determinism, “gender nihilism,” gender “passing,” the staggering toll of hate crimes against transgender people to what it really feels like to be a man or a woman. 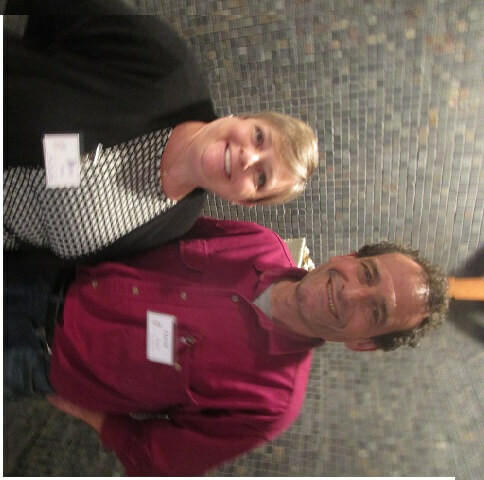 More from Brae to come. 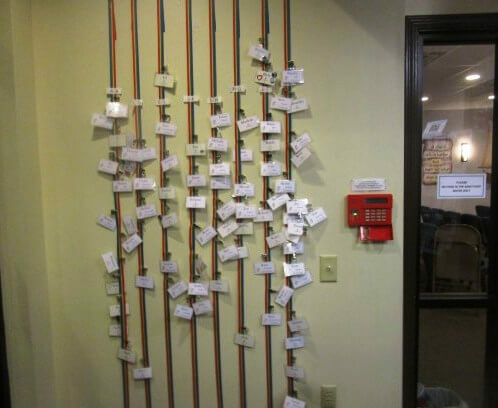 When first arriving at Open Arms, I noticed part of a wall on which were hanging dozens of name tags. Each tag simply included a name and 3 pronouns for each: him, he, his or she, her, hers or they, them and theirs. The mingling of pronouns and names tags without faces (but decorated with the church logo) made the space feel safe, communal and welcoming. 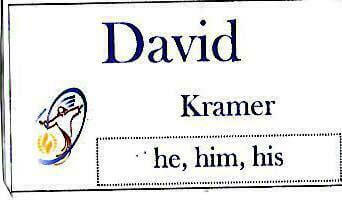 David Kramer: he, him, his. Brae Adams: she, her, hers. 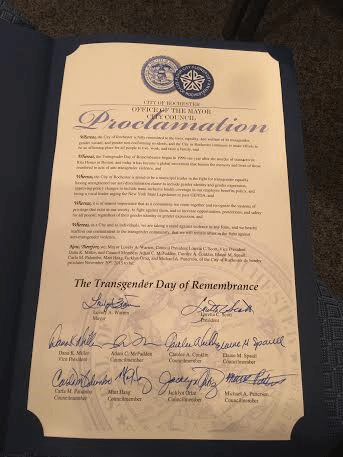 Appropriately, at the event, a representative of the City of Rochester read a Proclamation in support of the Day.